Photo originally from Spanish safari tourism firms Mebenca Safaris. A Spanish comedian has sparked an outcry reminiscent of that heard over Cecil the lion when photos surfaced of him posing with a dead leopard this week. Spanish comedian César Cadaval is known throughout the country for his sense of humour, but not many people have been laughing following his recent stunt. 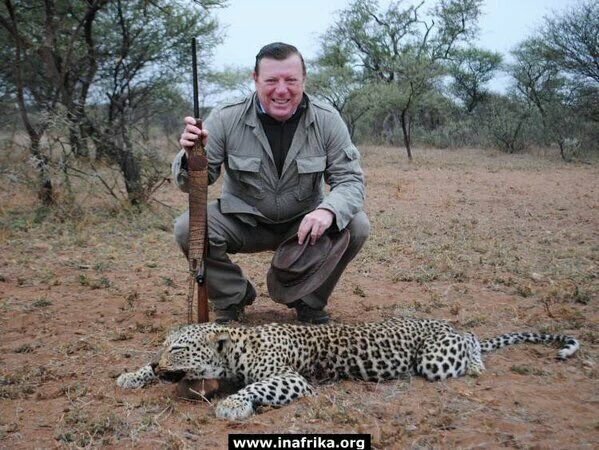 The humorist was snapped in a photo by a hunting tourism company, posing and smiling widely with a dead leopard at his feet. Cadaval had gone on a trip with the Spanish company Mebenca Safaris to South Africa near the border with Botswana to have a full "safari" experience. The firm boasts on their website to offer luxury accommodation on a ranch with "34 different animal species available to you," including the "big five": lions, elephants, water buffalo, rhinos and leopards. The company has since taken down the pictures with the comedy star. Spain's former king, Juan Carlos, has also been known to travel to Botswana through such programmes and provoked a similar uproar when the public learned of the luxury trip through leaked photos of the abdicated king and a dead elephant. Twitter did not react kindly to comedian Cadaval, who is known for his comedy duo with his brother, "Los Morancos". Spanish animal rights party, PACMA, wrote that "killing is not entertainment, César Cadaval". Some called for boycotts of Los Morancos. #BoicotLosMorancos Que César Cadaval sienta el desprecio y repudio de la sociedad!!. No vayas a sus espectaculos!! "#BoycottLosMorancos so that César Cadaval feels the disdain and repudiation of society! Don't go to their shows!" "Read this, César Cadaval: I'M NOT GOING TO SEE LOS MORANCOS ANY MORE." Newspaper La Vanguardia reported that when their reporters tried to get in touch with Cadaval, the person who answered his phone described himself as a "friend" and said the comedian was busy celebrating Holy Week in Seville. The topic of such glamorous safari hunting trips has been sensitive, especially after Cecil the lion - a popular attraction at a national park in Zimbabwe - was shot by an American dentist who had paid for the chance to kill a lion.